TEXARKANA, Ark. (INTELLIHUB) — Nearly 40 U.S. Army soldiers, wielding training rifles, dressed in full combat gear, were spotted participating in an urban warfare style training drill on Feb. 28th, just outside the Texarkana Regional Airport perimeter. After reviewing photos of the drill and talking to trusted military sources it appears that the soldiers were likely training to secure the local airfield in preparation for an unknown future event, possibly an economic crash followed by civil unrest. Even more interesting is the fact that the soldiers, rifles in hand, were out near the highway in plain view of the general public. Shockingly this may dovetail with the relocation of thousands of armored military vehicles seen positioned just outside several underground bunker complexes inside the continental United States (CONUS). However, even more importantly, hundreds of these armored military vehicles were spotted at the Red River Army Depot in Hooks Texas in late 2014, which is just four miles away from the Texarkana Regional Airport where the training drill took place on Feb 28th with nearly 40 soldiers. While it’s a known fact that Army depots store munitions, equipment, and weaponry, this particular case stands out a bit more than most as the soldiers spotted in Texarkana, Arkansas were training in the public domain, out in the open, in full combat dress, not at a military base or at a military training facility as they should have been in accordance to Posse comitatus. A featured comment on All Pipeline News, written by Mickey White, gives some insight into what takes place at the Red River Army Depot which White touts as a “negative” place. I worked at red river army depot and I have to say that is one of the most negative places to work because if you are not a brown nose or just do everything you are told that place stinks to high heaven with negativity. Another thing to consider is how much it is costing tax dollars to just keep that place open because of how dirty and careless they take care of the environment. They won’t tell you that it is one of the largest depots and the most expensive to keep open hence why they were going to close it down. But enough people, American people said keep it open because they wanted to have high paying jobs around that local area, not ever considering the greed that they succumbed to as I said NEGATIVE. That is why I don’t work there anymore because it almost cost me my family and my health. It also makes one think, were they trying to close it down because they wanted to use it as a secret place for something because there are some things you are not allowed to go to out there and have to have a high enough clearance. Also when I worked out there I had seen UFO activity over the depot and no one ever seems to look up and see it nor above New Boston, Texas. People need to wake up to realize that there are things that they don’t know is going on and they are scared of what they don’t know and want to just be in denial. Most people who work out there are in denial about everything that goes on because they are puppets as well. The time is not to start to awaken to this corruption because they day in shines in your face you will have a hard time being in denial from that point forward and think of how you all who were this way will feel. I can’t stand the place it sucked working out there. I worked out there for 5 1/2 years and will not go back for anything no matter how much they paid me. Love is they key and if you haven’t figured that out then you are perfect to work there. Love to all with peace happiness and joy!!! It’s also worthy to note that some, like Youtuber Professor Doom 1, who have been following the armored vehicle movements throughout the U.S., think that “the country has possibly been sold out […] handed over to the Chinese” and that the armored vehicles “are actually being taken out-of-the-way […] so our own military can not join with us and use them against them.” And while Professor Doom 1′s view may seem extremely unlikely to some, it may not be too far from the truth. In fact China is the biggest holder of U.S. debt at “$1.253 trillion […] as of October 2014″, according to an article published by About News. Japan comes in number two, holding “$1.22 trillion” of U.S. debt. 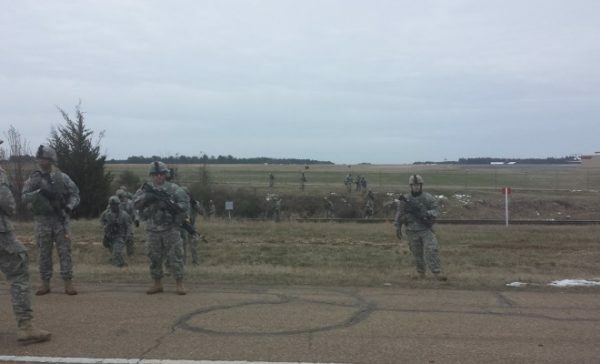 The Texas/Arkansas border is not the only place that unusual military movement has been recently observed. “What I find interesting is, is that our government has went into debt […] with China and that debt is going to become due.”, Professor Doom 1 said before going on to ask: “What exactly is the government willing to give up to repay this debt?”. I would like to add that although I myself can not say for sure what all of this military activity is and why it’s being conducted, I do feel that a big event is just around the corner as the U.S. dollar is on the brink of implosion. The United States is $18.1 trillion in debt and currently has no way to pay it back which reiterates my point. Whichever way you slice it, civil unrest is likely just around the corner and may be lurking closer than we all think. Remain vigilant and keep your head on swivel. If you or anyone you know spots any unusual military activity in the CONUS please [email protected] with the details. Is this Michelle Obama’s weenie?